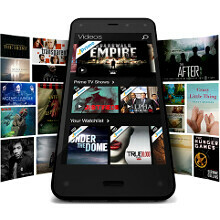 Besides the stellar hardware specifications of the Fire Phone, and the unique 3D-like Dynamic Perspective system, Amazon throws in a bunch of enticing freebies. First off, Jeff Bezos ties you in with unlimited cloud storage for your photos, and your Amazon content, on the company's world-class server farms, all for free. How cool is that? It's certainly way more generous than what Apple or Google offer, or even the Dropbox storage that HTC, Sony or Samsung throw in with their handsets. Next, those early adopters of the Fire Phone will be getting 12 months of the exclusive Amazon Prime service for free, including existing Prime customer, which will get a year extra. Amazon also tries to lock you in further with the Mayday 15-second customer service, as well as services like ASAP, X-Ray, Second Screen, and a smorgasbord of famous media apps like Netflix, HBOGo or iHeartRadio. Moreover, there's a new service called Firefly, which can recognize over a 100 million objects - from songs and artwork, through dishwasher soaps, to phone numbers on a poster, and find them at the lowest price, or throw more info about them at you. The free Amazon Prime offer actually cuts the contract phone price in half, and when you add the unlimited free cloud storage that the Fire Phone offers, it might very well tip the scales for some users towards this unique handset. Well thats a nice incentive to get a so-so smartphone with a crap carrier. The only thing that could be considered so-so on this phone is the 1280x720 display. But everything else is top notch. Snapdragon 800 CPU with an adreno 330 GPU, 2 GB of ram, 32 GB of storage, WiFi ac, dual band WiFi and wifi-direct support, LTE, dual stereo speakers, ois 13mp camera, and more. List another smartphone with 6 cameras. So what specs make this a so-so smartphone? Not to mention a year of free amazon prime instant video, and a year of free music with access to 20 million songs. The music and videos alone are worth the $199 for the phone. Are you really getting this for free or is it built into price of purchase? As Amazon has access to your entire phone and all your personal data, obviously the business model for this phone is the usual Silicon Valley ream job. The "Video" hub in Amazon phone looks extremely similar to Windows Phone 8.1 "Store" hub. Sounds not bad if the contracted price is $100 or less. Amazon should pay people to use this phone. The LG G2 is free on contract with ATT and is a mighty fine phone compared to this terrible Amazon phone.